This is a guest post by Jon Lee of MNI Drumworks in Austin, TX. In the fall of 1993 my parents gave in. The past 18 years had been a torturous, ear bleeding ordeal for both my Father and beautiful Mother. I had slapped, hit, tapped, knocked, kicked, and played EVERYTHING in every house that we had ever lived in, or vehicle we had owned. From banging on pots, pans, lamp shades (great cymbals), to foot pedal trash cans (great hi-hats) and seat cushions…I was born to play drums. The only drum kit I have ever owned is as a 5 piece Mapex Mars kit (later 6 piece) that I bought from Phil Fisher at the Drum Connection on North Lamar in the summer of 1993. The kit is obsolete by today’s standards, but there weren’t a lot of technological advances in drum design for beginner kits in the early 90s. When Pearl and Tama introduced suspension mounting systems for drum kits under the $1,000 price range, it was a revolution. A concept that just about every drum company foreign or domestic soon adhered too, including Mapex in the late 90s. For me, I got to hit stuff really hard, and could hit stuff really hard without breaking my parent’s . If anything the first few weeks playing would have been like watching an Animal impersonator screaming WOMAN WOMAN while banging away in the garage. Opening for Lisa Tingle and Black Pearl. Antonio’s Fall 1994. This one kit saw the likes of Babe’s on 6th Street, Steamboat, Antonio’s Cantina, Fiesta Gardens, The Brushy Creek Inn, The Georgetown Opry, The Possum Creek Inn, San Gabriel Park, John Redden’s house in Speegleville, even an RV park off the Blanco River and more holes in a wall than I currently have. It saw Rock, Metal, Progressive Fusion (Sorta), Classic Rock, Country and then it saw the inside of drum bags…for 13 years. At 8:30PM on Wednesday, January 12th 2011 A.D., Newman Ramzel, a friend from high school, called and asked, “Hey Jon, are you still playing drums?” Shocked, my response was, “Not really. I’ve not taken my drums out of their cases since last century.” Needless to say, the last 13 years were not good to my drums. The Texas heat had warped the plastic wrap that covered the drum’s shells, and in some cases had actually melted the glued bond causing the wrap to lift off the shell, and splinter parts of the outer ply of Mahogany. Warped and cracked Black plastic wrap that covers the drum shell. Pitted and rusted lugs and lug struts. The Hoops, Lugs, Lug Struts, and Tension Rods were all pitted and rusted. The cymbal stands and practice pads I had stored in a large Rubbermaid container didn’t fare well either, but were functional…just like the drums. I never really cared what my drums looked like before…just as long as they sounded good. When the Bass Player and Drummer for Lisa Tingle comes up to you after a show and say, “Your kick drums sounds great! Do you have those tuned differently?”, that was all I needed to hear. I guess I kinda knew what I was doing? Perhaps I’ve grown up, or perhaps I now appreciate my belongings. Whatever the case, I just knew the drums looked like something that survived an IED. After attempting to resurrect the once mighty 6 piece double bass kit in my garage in South Austin, I noticed that there were going to have to be many modifications to nuts, bolts, fasteners, clamps…a lot…more than you think…a lot. After 3 or 4 trips to Lowes, I had the kit setup just as I had 13 years prior. It felt good right off the bat to be playing those crappy looking, beat up, black drums again. Over the course of 3 months practicing, rearranging, and waiting for DW to manufacture a set of custom pedals and stands for me, I had everything on the kit exactly where it needed to be. But, something was amiss. The kit sounded good as always, but just flat out looked like dog doo doo. This was unacceptable. The band members in my band BR?L, all have really nice gear. The drums just didn’t fit in. Something had to change. After deciding what it was I felt I needed for my sound, and what customizations I would desire…I sent out a few bids to American drum companies. I figured I’d help out the economy by buying in the U.S. right? Wrong. 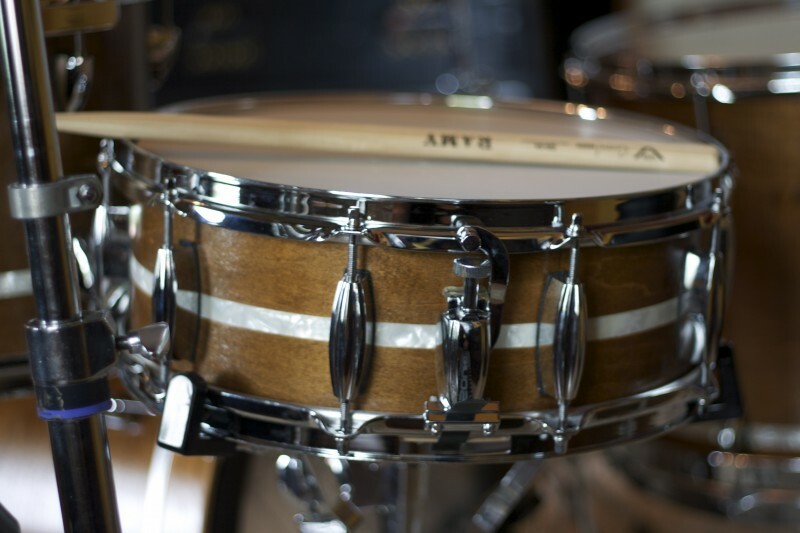 Out of the 5 or 6 “American” drum companies, only 4 physically make their drums in North America, much less make drums within the base 48 states. The prices for those drums that were actually made in the U.S., were astronomical and completely ridiculous, over $4,000. Plan B was forced into effect. My options were: A) Buy a cheaper “American” kit manufactured in Taiwan. B) Buy an imported drum kit built by kids working in tiger cages. C) Make my own drums. D) Refurbish the great sounding drums I already own. After a lot of research and debate, and the hours of various YouTube videos of other’s making and refurbing drums…I used a Jack Burton line and said, “What the hell.” I’m going to refurbish my drums. I can’t thank Philip Ellis of P. Ellis Drums in Austin, Texas enough for the inspiration and pointers, tips and tricks for refurbishing and manufacturing drums. Philip will most likely be making my next set of drums, seeing that Fibes is no longer making drums. Philip is the man. Handrubbed Black Stain with Satin Clear Coat. The drums were going to be Black. Period. Henry Ford said it best. “You can have one in any color as long as it’s Black.” Transparent Black finishes have always rocked my world. I’m not a fan of shiny things…so High Gloss lacquers were out of the question. Black Satin Stain was going to be the ticket. I had to first clean the shells with a variety of solutions that would remove a lot of the weather stains and actually allowed the grain of the wood to really pop. The kick drums had tom mounts on them when they were purchased have not been needed since I bought a Pearl DR-110 Rack in 1995. So, I bought wood filler and with the advice of my guitar building friend and band mate, Newman Ramzel, used the sanding dust and superglue to create a seal that made the holes look a lot less like holes. I could have bought Maple dowels and trimmed them down to plug the hole, but a $1.00 can of Minwax wood filler seemed like a quick and simple fix. /shrug Then it was…Sand, Sand, Sand, Stain, Sand, Stain, Sand, Sand, Clear Coat, Sand, Clear Coat, Sand, Clear Coat…I wanted to stress the time that was consumed. I let the drums set overnight after each Stain and Clear Coat. For not having stained anything other than bloody Gymnastics grips in high school, I thought I did pretty good. Again with the shiny…the hardware which WAS a high gloss Chrome finish needed work. I saw Black Powder Coated or Nickel Plated hardware all the time on custom kits. However I quickly found that Black Powder Coating and Black Nickel Plating ended up being very expensive. The next best thing was scratching up the hardware so it didn’t shine, and give it a Brushed Steel look. I bought a bag of Steel Wool in different grades and got to work. I’ll be damned if the wool didn’t remove all the rust and pits, but what I was left with was lugs, hoops, and tom mounts POLISHED to an eye bleeding shine! Damnit! It took about 3 days to “polish” the hardware. Thankfully there were decent shows on Discovery and History while this was going on. The already arduous tast would have been much worse with Finding Bigfoot or American Chopper. The combination of Wool, Windex, and pressure really did a number on my hands. Almost giving me the sense that I had worked out for 3 days in Gymnastics again. In the end, it wasn’t what I was expecting, but it was worth it. The FIRST MNI Drumworks drum! 6ply Maple/Mahogany 11×13 Tom. Heads are Aquarian Response 2 Coated on top and Classic Clear on bottom. Everything came together when I paired the Transparent Black Satin shells with the Polished Chrome lugs, hoops, an mounts…what a great contrast! I had the drum badges custom engraved from a source we use at my printing company here in Austin. Brushed Aluminum with Black inlay baby. I love them! I decided not to put any serial numbers on the badges because I knew there would never be another MNI Drumworks kit again. Well, not anytime soon. I can’t wait to get these things out and on a stage and let them SING! The drum kit consists of 6ply Maple/Mahogany shells (22×16 Kick, 12×10 Tom, 13×11 Tom, and 16×16 Floor Tom), which were quickly discontinued and turned into inferior and less expensive Basswood/Mahogany shells in 1994. There were long struts that connected the top and bottom lugs which really looked bad and frankly hid too much of the shell. Those were removed and really made the updated drums look soo much better. I love the small single screw mounted lugs from Mapex and decided to just keep them on rather than buy new lugs and have to drill new holes for a 2nd screw mount. Plus, the tension rods hanging out the bottom of the lugs actually look really great! Switched out all the old heads for Aquarian Coated Response 2 heads on the tops of the toms and Classic Clear heads on the bottom. The Super Kick 2 and Regulator heads on the Kick Drums and are the same 10 year old heads I’ve used…they allow the kick drums to exert enough force to blow your heart through the back of your body and onto the poor guy cheering behind you! So if you come out to see the band BR?L in Austin, San Antonio, or a cave somewhere in Texas…you’ll see my labor of love while you’re dancing and enjoying the music. Just wear a chest protector…especially when we play “All I Know”. CLICK on the BR?L tag on the left side of this note and LIKE BR?L on Facebook for upcoming shows, fan giveaways, and shwag! BUY our album Broken World on iTunes http://itunes.apple.com/us/artist/id428522615 or get in touch with one of us and we’ll sell you an actual CD with pretty pictures and lyrics for only $5.00!